1st Platoon, A. Company, 643rd TD BN. I remember telling you about this picture a while ago. I just found it yesterday. This is a couple that my Dad stayed with during World War II. They were kind enough to let him stay inside and sleep there. The picture was taken in Belgium in 1945. I and Family members that did send me this picture were unsuccessful in locating the home. Upper left is John Robotti, middle is Phil Bacco, right is Paul Yankowich. John Smith and Paul Yankowich were together with Louis in the 643rd. Phil Bacco and John Robotti were presumably later transferred to another Tank Destroyer unit. 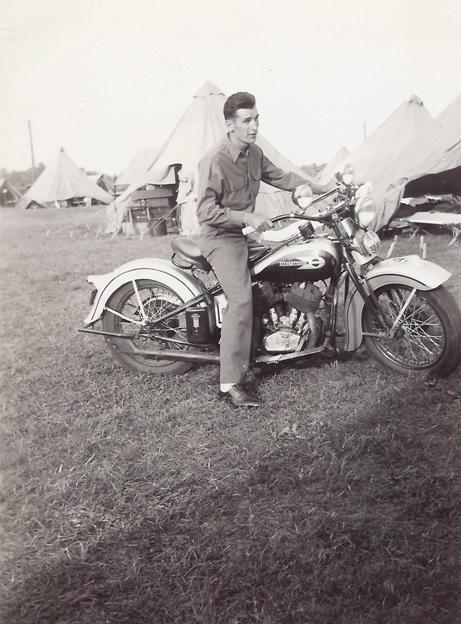 Louis on Harley, Camp Shelby, Miss. The picture on the left was taken in 1993 Paris, France. Louis was big on going on the World War Two tours and did so several times. Phillis Stinson and Beverly Vassallo, Louis Daughter. Looking at your site. I don't see Louis j. Boasso. He won a Bronze Star. I need to know how he won. He died and then we found out about the Bronze Star. We want to know how he got it.Thank you, Phyllis Stinson. 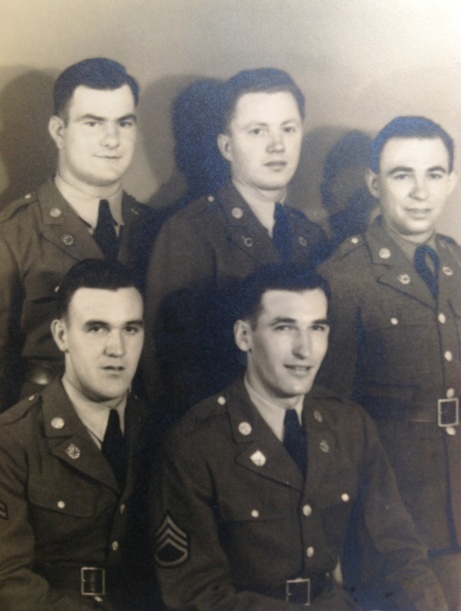 Staff Sergeant Louis J. Boasso, 20133197, Field Artillery (TD), 643rd Tank Destroyer Battalion, Unites States Army, for distinguishing himself by meritorious service in connection with military operations against an enemy of the United States from 24 December 1944 to 31 April 1945. Entered the military service from Connecticut. Below is a picture of my Dad's Medals. The top patch of course is the panther of the 643rd. It is an original. I took it off my Dad's uniform when I was around 19 years old. An actual patch that fought overseas on the arm of a soldier and FATHER of whom I am very proud. My Dad and his 2 friends , Ed Bobinski and Ed Wolozyn donated to the museum. I don't know if all, but I remember my Dad saying that there was an attack and many of the men were killed. Ed Wolozyn they called "The Mad Russian"
They have all passed away and hopefully are telling their fabulous stories in heaven.